What Changes Occur in the Intestine After Gastric Bypass vs Vertical Sleeve Gastrectomy ? The intestine adapts differently to Roux-en-Y gastric bypass (RYGB) than to vertical sleeve gastrectomy (VSG), researchers show in the February issue of Gastroenterology. RYGB increases intestinal glucose disposal whereas VSG delays glucose absorption, but each reduces glycemia. Bariatric surgeries such as RYGB and VSG are the most effective ways to resolve type 2 diabetes in obese individuals. RYGB reduces gastric size and intestinal organization such that ingested food bypasses approximately 95% of the stomach, the entire duodenum, and a short portion of the jejunum (see figure). In VSG, on the other hand, approximately 80% of the stomach is removed, along the greater curvature, with no intestinal rearrangement. These different surgical procedures produce similar outcomes. RYGB and VSG lead have been reported to reduce body weight by 28% and 25%, respectively. Furthermore, RYGB and VSG led to remission of type 2 diabetes in 42% and 37% of patients, respectively, 1 year after surgery. Alimentary glucose absorption and intestinal disposal of blood glucose have not been directly compared between individuals or animals that underwent RYGB vs VSG. Jean-Baptiste Cavin et al. therefore evaluated, in rats and humans, how the gut epithelium adapts after surgery and the effects on alimentary glucose absorption and intestinal disposal of blood glucose. They found that in rats and humans that underwent RYGB, the Roux limb became hyperplasic, with an increased number of incretin-producing cells compared with the corresponding jejunal segment of controls. Furthermore, expression of glucose transporters and hypoxia-related genes increased, and the nonintestinal glucose transporter GLUT1 appeared at the basolateral membrane of enterocytes. Ingested and circulating glucose was trapped within the intestinal epithelial cells of rats and humans that underwent RYGB. By contrast, there was no hyperplasia of the intestine after VSG, but the intestinal absorption of alimentary glucose was reduced and density of endocrine cells that secrete glucagon-like peptide-1 (GLP1) increased. The authors conclude that RYGB and VSG lead to metabolic improvements, and an increase in GLP1, via different mechanisms. In an editorial that accompanies the article, Darleen Sandoval explains that the observation that different anatomic rearrangements produce similar outcomes has posed a challenge to the hypothesis that the efficacy of bariatric surgery is mediated by mechanical factors, such as restriction of meals and malabsorption of nutrients. She explains that bariatric surgery induces numerous physiologic changes that are comparable between RYGB and VSG. For example, the surgeries induce a 10-fold increase in nutrient-induced GLP1, increase levels of plasma bile acids, alter the intestinal microbiome, increase hepatic insulin sensitivity and insulin response to a meal, and increase the rate of gastric emptying. Cavin et al showed that in addition to producing changes intestinal morphology, RYGB increased expression of glucose transporters and increased glucose transport into enterocytes from the basolateral, rather than the luminal, side of the intestinal wall in the roux limb of RYGB rats. Cavin et al proposed that the increased intracellular glucose was used by the intestine as a fuel for hyperplasia. Sandoval says that additional studies are needed, but the findings of Cavin et al indicate that rapid nutrient entry directly into the small bowel induces secretion of GLP1 secretion after RYGB, and the intestine contributes to rapid post-prandial glucose clearance via basolateral transport of glucose into enterocytes. These findings provide direct evidence for the role of the intestine in glucose handling and subsequently overall glucose homeostasis after RYGB. The findings were similar between rats and humans. VSG also improves overall glucose homeostasis, but does not appear to alter intestinal morphology. 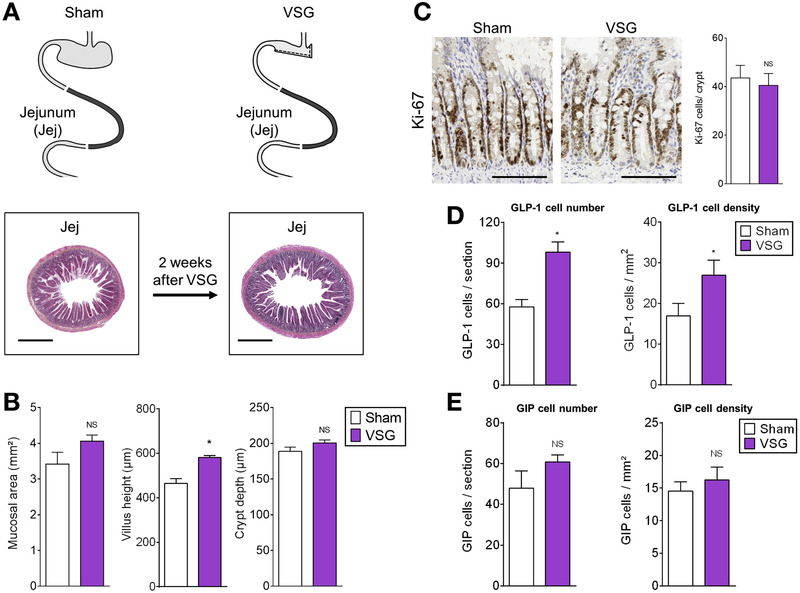 Rats that underwent VSG had reduced, rather than increased, glucose transport across the jejunum. 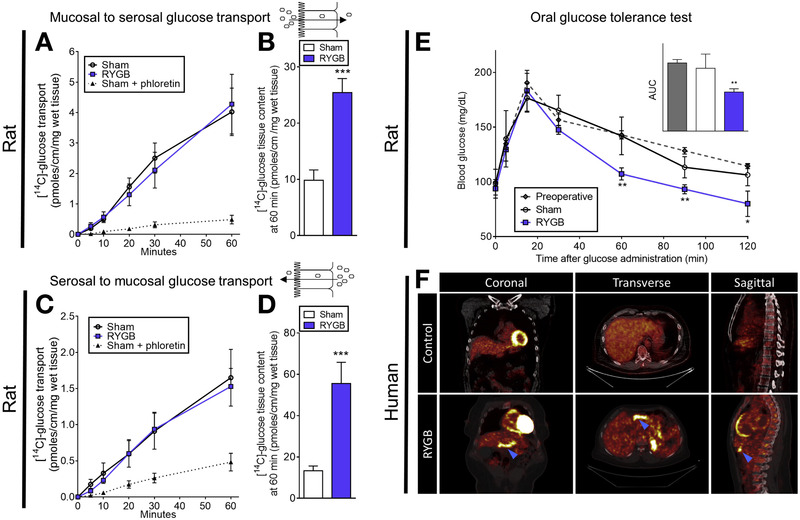 Cavin et al propose that the delay in glucose transport contributes to the improvements in glucose homeostasis after VSG. Perhaps with VSG, slower glucose transport is sufficient to compensate for the increased gastric emptying rate with lower, but not higher nutrient loads. Sandoval says that further studies to compare the mechanisms of RYGB vs VSG will increase our understanding of the links between adaptive changes in intestinal form and function and overall metabolic health. Is Bariatric Surgery the Best Treatment for NAFLD?